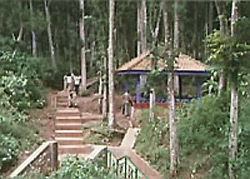 Geger Hill tourism is located in Geger village, Geger district, and 30 km southeast of the city. Reside in 150 to 200 meters dpl height. This location is easy to reach by public transportation. This object tourism is prospective to develope as forest object tourism, because it has camping ground area and climbing sport. Besides its nature beauty, this tourism objects has a sanctified statue and ancient omission. Acacia forest, Mahogany and teak forest with 42 ha width more. Five sacred caves that have historical nuance are; Petapan Cave, Adipodai cave, that is the father of Madura legendaries figure, Jokotole alias Panembahan Secodiningrat III at XIII century. Potre Cave, ex Potre Koneng cave, the wife of Adipodai, Pelanangan Cave, have the stalactite that looks like man genital. It has said if drink the water that drops from this unique stalactite, it can add the man sexuality energy. Pancong Pote Cave, have the unique form of subterranean river, its stalactite and stalagmite are colorful. Snake Cave, have its unique form of giant stone looks like snakehead. Have bank side in its north and south side, so that, it is ideal for having climbing activity here. Pangelengan Hollow, is bank hollow in the hill wall of north side. It is nicely, this hollow is extent of granite rock / onyx, so that it is very fit for rest place, and enjoy the beautiful of natural lake and extent of wide rice field in foothills. 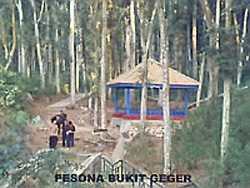 Pelanggiran site is in reef hillock form. This is the highest top from Geger hill. It has said, at 8 century ago, this Pelanggiran historical tools is landing place of the first human being in Madura, named Patih Pranggulang (Ki Poleng) and Dewi Ratna Roro Gung (Kuning Princess). In this historical area, the first Madura R Segara boy, was born from Dewi Ratna Roro Gung womb.